This shampoo and conditioner were included in a lovely goodie bag that Lizzie gave to everybody who was at the BBloggers Afternoon Tea in Sheffield last month. I thought I would just do a little review on them as I have been trying them out for the past few weeks. When I saw these in the bag I was quite interested in trying them out, as I am constantly at war with my sometimes curly, sometimes wavy, always frizzy hair. 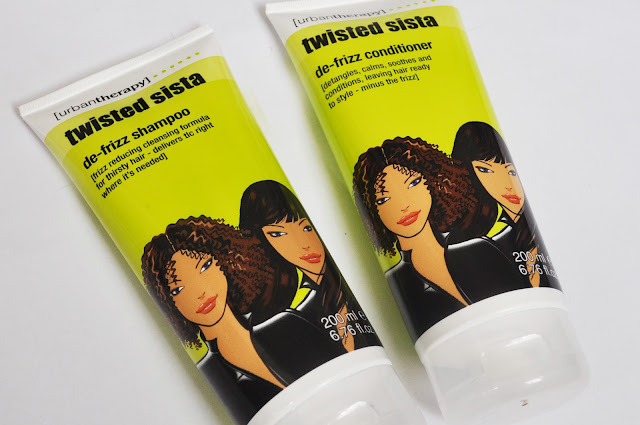 I did a little research on Twisted Sista and found that they are a brand that focuses on curly and afro hair, although they have also branched out to cater for straighter hairstyles too. I'm not overly fussed about the packaging of these products, I feel that it is something that would have appealed to me more when I was 12-13 years old with the bright green colour and the illustrations. You get 200ml in each tube, which is quite a generous amount considering the price of the product. What it says: Frizz reducing cleansing formula for thirsty hair- delivers TLC right where it's needed. I'm not sure how I feel about the smell of this shampoo, it has quite a tropical fruity scent, a bit like an artificial banana fragrance, which I have never really been a fan of. It is a bit overpowering for me when I am using it, but I find that the smell is really subtle and actually quite nice when your hair is dry. The product has a typical shampoo consistency and lathers up well. It does it's job as well as any other shampoo and leaves my hair feeling clean. I do find that the day after shampooing my hair (I wash my hair in the evening), my hair isn't as frizzy as usual, but only if I brush my hair before I go to bed and tie it up whilst I sleep; my hair has never agreed with having a hair brush dragged through it. What it says: Detangles, calms, soothes and conditions, leaving hair ready to style- minus the frizz. The conditioner has the same banana-like smell as the shampoo, which I am not particularly fond of when I'm washing my hair, but as with the shampoo, the fragrance isn't so apparent once my hair is dry. I think this conditioner has quite a thinner consistency compared to other conditioners I have used, but it is still easy enough to spread through the lengths of your hair. I usually leave conditioner in my hair for around 10 minutes to let it do it's job, and this one did quite a nice job of detangling my knot-ridden hair in this time. Again, my hair didn't feel as frizzy as usual the morning after using this. I don't think I would purchase these once I have used up the tubes that I have, simply because I am not the biggest fan of the smell and the packaging just isn't something that appeals to me. This, however, is just down to personal preference. The product does it's job quite well although I don't think it is anything particularly special. I am actually not sure where you can buy these in the UK, but I have found them online at Amazon for £4.99 each. I have heard that some Asda, Tesco and Bodycare stores sell them for between £2-3 so if you would like to try these then check out those stores. If you are in the US, I believe that these products are available at Walgreens, Target and Walmart. 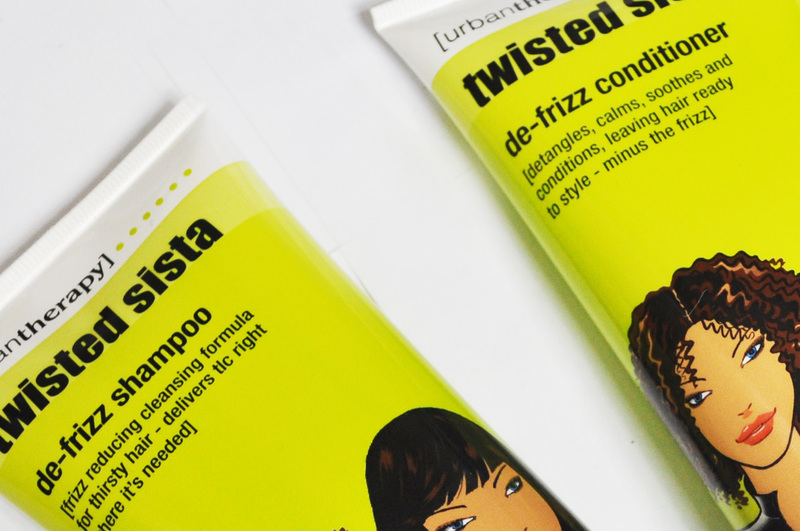 Have you heard of Twisted Sista? *DISCLAIMER: This product was gifted to me free of charge. My opinions are still 100% honest. Interesting Post ,thanks for the Review! They look really cute for a holiday grab or something and the idea of a tropical scent fits with that too maybe? I'm in desperate need of a detangler too ha-ha! This brand is quite popular here in the US among the curly/afro hair community, I have yet to try them. The packaging is definitely not appealing, haha. i just bought some tonight for my baby girl so i will keep you all posted on how it works. I only use mixed chicks in her hair, which works amazingly, but this twisted sista is really inexpensive so i thought i might give it a try. I hope i love it!! !